It is the fall of 1971. Richard Nixon is in the White House. The nation is still in turmoil over the war in Vietnam. The daily body count is diminishing but not the anger over the war’s conduct or the President’s intent on victory. He has moved the bombing into the north. The national dissonance also has preoccupied Congress; not only the war but also the need to recognize new values through law: dislodging corporate comfort before regulatory agencies, protecting consumers, enhancing the environment and protecting the public’s health. Resistance is here as well. The established law firms hold tightly. Within George Washington University, five law students decide to do a practical group project. They take on the Nation’s Railroads and the oldest regulatory agency, the Interstate Commerce Commission. They want compliance with a new law, the National Environmental Policy Act and its application to freight rates. They want the unnecessary extraction of natural resources and the impediments to recycling analyzed and stopped. Their name: Students Challenging Regulatory Agency Procedures, SCRAP. In a stunning surprise, published in the New York Times, they petition for compliance with the law and a billion dollar refund. The legal prowess of the Commission and the Railroads confronts them. It is David versus Goliath. As author Neil Thomas Proto reveals, the five find the tools and inner persistence to meet the challenge. SCRAP gets help from Hill veterans. They also provoke historical tensions within industrial and environmental groups. Proto describes the maneuvers by both to undercut SCRAP. In May 1972, SCRAP sues the United States. Relying on court transcripts and Proto’s own insight into personalities and arguments, we get to the heart of the battle: The Justice Department and the Railroads argue SCRAP has no “standing to sue”. Calling on the legendary legal skill of Covington and Burling, the Railroads seek to diminish SCRAP and dismiss the law suit. Following epic confrontations of wit and law before Charles Richey and J. Skelly Wright, the court enjoins the collection of freight rates on recyclable materials and concludes SCRAP has standing. The story ends, and the Prologue begins, in the Supreme Court of the United States. Erwin Griswold, the Solicitor General uses all his force to undo SCRAP’s victory. 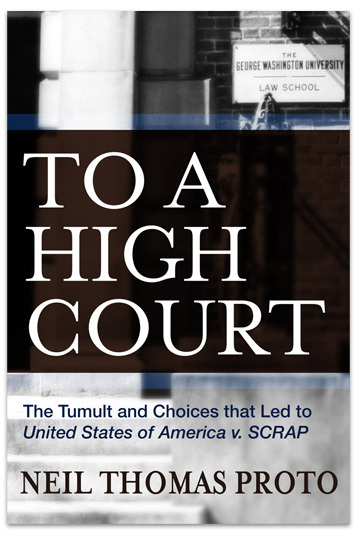 In June 1973, in a 5-3 decision, Justice Potter Stewart concludes SCRAP has standing. 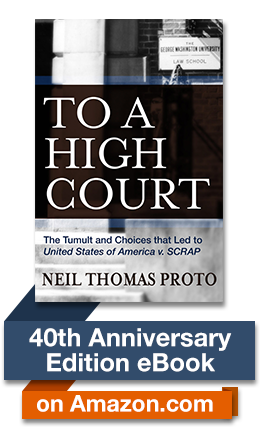 Through the recently released Papers of Justices Douglas, Marshall and Blackmun, Proto also reveals the inside tumult that yielded the Court decision.